I am a big user of scented dryer sheets so I was thrilled to receive Purex Dryer Sheets in the Fresh Spring Waters scent to test out. These fabric softener sheets reduce static cling, repel pet hair, repel lint and leave your laundry smelling fresh. The Fresh Spring Waters scent is crisp, clean and fresh. You have 30 days of long lasting freshness. If you use with Purex Crystals laundry enhancer, you will have even more freshness for weeks to come. They are so easy to use. Just place one in your dryer and you are ready to go. The sheets can also be used around the house such as in hampers, linen closets and garbage pails to give your whole house a great scent. They are also available in the Lavender Blossom scent and are located in the fabric softener aisle of your favorite store. Want to try this product? 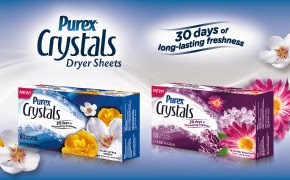 Three lucky winners will be chosen for a free coupon of Purex Crystals Dryer Sheets. Awesome giveaway and I love adding extra scents to my wash. I want to try the Fresh Spring Waters scent because I love the Lavendar Blossom! these smell amazing!!! i would love to win a box. I haven't tried these but I would love to! Super excited...especially since I am almost out of dryer sheets!